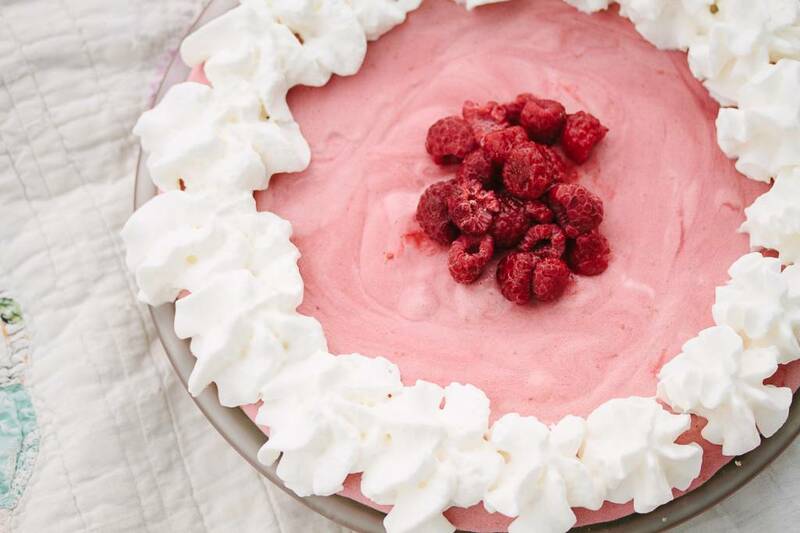 No Bake Raspberry Chiffon Pie (S) Dairy Free Option! This recipe is a sneak peak into my THM compatible cookbook that will be available for pre-orders just soon! I have been living and breathing “cookbook” the last few months, so I am SUPER EXCITED that they’re almost ready for you! Combine crust ingredients. Press on bottom and up the sides of a 9 inch pie plate. Refrigerate. In a saucepan, combine frozen raspberries, 2/3 cup water, and lemon juice. Simmer until raspberries are soft. Cool and then blend until smooth. Sprinkle gelatin over 1/4 cup cold water and set aside for 10 minutes. Separate eggs. Put yolks in saucepan and add 2/3 cup sweetener and raspberry puree. Whisk while bringing to a boil. Remove from heat. Whisk in the gelatin mixture until smooth. Cool completely in sink of cold water. Beat egg whites until foamy. Add cream of tarter and 1/4 cup sweetener, continuing beating until stiff peaks form. Gently combine the raspberry puree with the 1/2 cup whipped cream and egg white mixture.. Pour onto crust. Refrigerate 2 to 3 hours. Garnish with whipped cream and fresh raspberries. *Use Dairy Free Whipped Cream to make this recipe dairy free. Just a note: I use a sweetener that measures cup for cup like regular sugar. (1 cup erythritol and scant 1/2 t. THM brand stevia) If you’re using something else, you will have to adjust it accordingly. I would love to purchase one of your cookbook and I would also be so great full if you would sign it for me. Thank you, and God Bless. We’d be glad to do sign if for you! If you’ve signed up for our email list, you will receive notification when the books are available for pre-sale. Be sure to ask about a signed copy when you place your order.